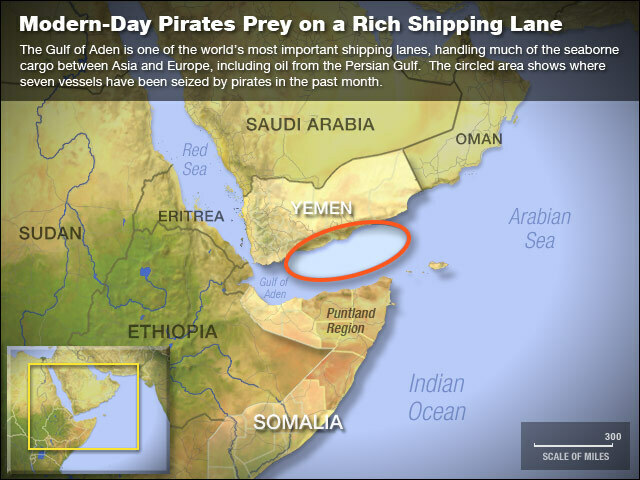 Piracy Flourishes Along Crucial Shipping Lane Pirates have been capturing ships and kidnapping crews in the Gulf of Aden, off the coast of Somalia. Four boats were targeted in the past week alone. So far, a U.N.-backed naval fleet seems unable to stop them. The ghostly image of a suspected pirate "mother ship," whose name is believed to be either Athena or Arena. 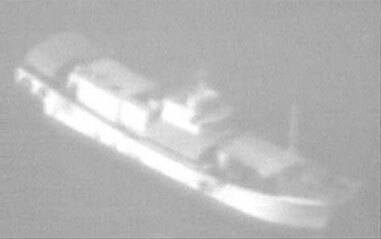 The ship, photographed by aircraft from an international naval fleet in the Gulf of Aden, is believed to launch small speedboats loaded with gunmen to capture merchant vessels off the northern coast of Somalia. Coalition forces, courtesy of the IMB Piracy Reporting Center. Coalition naval forces in the Gulf of Aden suspect that this Russian-built trawler, called the Burum Ocean, is a "mother ship," carrying the small speedboats that pirate crews use to attack and hijack merchant ships in one of the world's busiest sea lanes. In an age when piracy has come to mean copying someone else's intellectual property, the seafaring variety hasn't gotten much attention. But it's making a comeback along the 1,800-mile coastline of Somalia, a failed state where the law has little control. Just last week, pirates attacked four ships off the coast, hijacking the vessels and kidnapping their crews. The International Maritime Bureau, which keeps track of pirate attacks around the globe, says there have been seven ships hijacked in the past month in the Gulf of Aden, the body of water between Somalia and Yemen. Although they lack the flamboyance of Capt. Jack Sparrow, the pirates of the Somali coast are ruthlessly efficient. In each case, the marauders chased the vessel down with small, fast boats, firing automatic rifles. When the merchant ships stopped, the attackers scrambled aboard and took the crews hostage. The latest ships to be captured — all on Aug. 21 — include an Iranian bulk carrier, a Japanese-operated chemical tanker with 19 crew members, and a German freighter with nine people aboard. Just the day before, pirates seized a Malaysian tanker with a crew of 39 in the same area. The tanker was bound for Rotterdam with a load of palm-oil said to be worth about $2.5 million. The pirates typically hold crew members for ransom. That's what they did with the 30-member crew of a French cruise ship that was seized in the Gulf of Aden in April. The luxury sailing vessel "Ponant" can carry more than 60 passengers, but none were aboard when the yacht was captured on its way back to the Mediterranean. The International Maritime Bureau, a Malaysia-based agency that tracks piracy worldwide, says some pirates appear to be using "mother ships" to bring their speedboat crews out into the sea lanes, where they can attack. The United Nations passed a resolution in June authorizing "all necessary means" to repress piracy in the region, allowing foreign warships to enter Somalia's territorial waters in pursuit of pirates. The resolution acknowledged that Somalia has no power to interdict pirates or patrol its own coast. In fact, the country has not had a central government with any significant power since warlords overthrew dictator Mohamed Siad Barre in 1991. But shipping companies and piracy experts say that, so far, the nations that have the military power to take action under the U.N. mandate haven't done so. "The U.N. resolution has done nothing to prevent these attacks," says Pottengal Mukundan, the director of Commercial Crime Services for the International Chamber of Commerce. There is a coalition naval force in the region, composed of ships from the U.S., Canada, Britain, France, Germany and Pakistan, which reportedly is tracking the hijacked vessels. But Mukundan says that once a vessel has been taken, it's too late for military action, which would further endanger the crew. Mukundan says the coalition fleet doesn't have the resources to do what's really needed, "to disrupt this activity before the vessels are hijacked. They need to board and question suspicious ships when they spot them." He says piracy is still a relatively low priority for the navies involved, "but it should be higher. This is the major seaway for all vessels coming from Europe through the Suez Canal." Mukundan says the ransoms paid for ships and crews taken by the pirates are driving up insurance rates for all the vessels that pass through the Gulf of Aden, and adding to the cost of most of the goods that pass between Europe and Asia. The money also is going to one of the poorest regions on earth, he says, where crime lords use it to consolidate their control and keep the region unstable. Much of the piracy is believed to be centered in the northern Somali region of Puntland, right at the tip of the Horn of Africa. According to the Reuters news agency, pirates are using their stolen wealth to buy expensive cars, build lavish houses and marry additional wives.